Michael Trent and Cary Ann Hearst like to play rough together. And by following the two-heads-are-better-than-one line of thinking, they hope to make some noise after officially turning their solo acts into a duo called Shovels & Rope two years ago. The first product of this Odd Couple-like relationship is O’ Be Joyful (Dualtone Records), a homemade record seared with country rock and punk influences. Their 11 well-crafted songs, some that belong in a Coen Brothers movie, include double shots full of piss and vinegar. Already landing on the Americana charts before the album’s July 31 release, they’re taking their act to the West Coast, followed by a documentary film crew out of Nashville called the Moving Pictures Boys that’s been shooting footage of them for the past two years. Trent, 34, (left) and Hearst, 32, seem like polar opposites, and their decidedly different geographical roots are largely responsible for that. The Denver dude had trouble staying in a “horrible private school” before graduating in 1996, while the Mississippi missy often traveled the City of New Orleans train from Hazelhurst to Yazoo City. But they eventually found commonality in a wanderlust that landed them in Charleston, South Carolina. The pair started making music that’s “equal parts spirited and raucous as well as poignant and tender,” Hearst said over the phone last week from (of all places) Denver, where they were taking a brief touring break and visiting some of Trent’s family before heading off to Lake Powell for more serious R&R. Feeling a musical kinship with couples as varied as John Doe-Exene Cervenka of X and the Knitters (Poor Little Critter on the Road) and Gram Parsons-Emmylou Harris, they were particularly inspired by the rough-and-smooth combination of Lucinda Williams and Elvis Costello. Both started out as artists in different bands and released solo records, but were involved in a personal relationship before they united as one musical entity. The fast-talking, wise-cracking Hearst, who at the age of 8 moved to Nashville with her mother, is more than a little bit country. Yet, her musical identity might be traced back to the Cramps’ Poison Ivy and Lux Interior, not Johnny Cash and June Carter. Hearst took a John-and-Exene vocal comparison as a “wonderful compliment,” saying the dynamics of X’s singing-songwriting team were “a little bit more complicated” than Johnny and June’s. “We don’t have an internal power struggle, but I feel like sometimes we get received that Michael is this quiet, quiet storm and I’m always jibber-jabbering,” she added. Rockamount Cowboy in a rock and roll band, plugged his amplifier in all across the land. Athens, GA on a Friday night, saw that little girl, she could sing alright. Hearst called “Birmingham” a “psychedlicized, semi-fictionalized, definitely abbreviated version of true events,” referring to Trent as her Rockamount Cowboy. The thoughtful, more reserved Trent chuckles when asked if that’s how he envisions himself. They formed a friendship while sometimes playing in each other’s bar bands in South Carolina. Personal serenades involved old-timey country and punk rock. Trent and Hearst even put “Can’t Hardly Stand It,” a Charlie Feathers song covered by the Cramps, on the first record they made together (under their own names), 2008’s Shovels & Rope. “I’d bring over a case of Bud Light and we’d make little rudimentary recordings in the living room,” Trent said. “That’s how we flirted with each other,” Hearst interjected. After earlier terminating a long relationship “that wasn’t going anywhere to free myself up to go on musical adventures,” Hearst eventually tied the knot with Trent at Charleston’s only domestic vineyard, which she appreciated for its muscadine wine. Michael: Three years. (To Cary Ann:) Is that right? For the record, Michael Trent Robinson and Cary Ann Hearst were married at Irvin-House Vineyards on Wadmalaw Island on March 28, 2009, the year after Shovels & Rope, the record. But it was 2010 when they adapted that colorful combination as their band name. After another guttural laugh, Hearst explained herself. “So many years of Michael’s life had been spent on the road scratching out a future for himself,” she said. “So much of my time had been spent trying to distinguish myself among the sea of red-headed singer-songwriter female musicians out there that to take our names off of our own individual projects after we had kind of almost … we just made really good records. And I am not ashamed to say like, our records that we made, solo records, are plenty good to have made it a career as individuals with a band. While renting a house on Johns Island, they also built quite a collection of their own records, with Hearst’s Lions and Lambs, Trent’s The Winner, both completed in 2010, and Shovels & Rope. It was a time when, as Hearst put it, they “didn’t have two pennies to rub together” while their musical inventory was collecting dust. So going — and staying — on the road to unload some of that product was a necessity. In the rapid-fire fashion of a carnival barker, Hearst has her spiel to live audiences down pat. 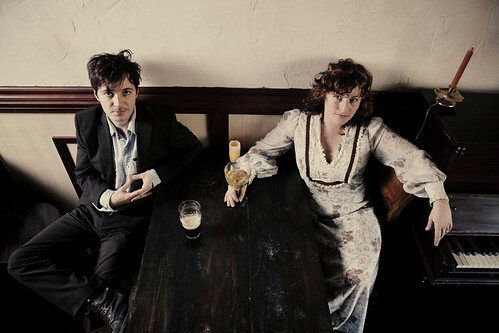 Those records continue to sell well at shows while Shovels & Rope play about 200 nights a year to crowds amazed to see how one man and one woman can pull off performing with grungy guitars and other string instruments, keyboards and a beat-up drum kit all by themselves. On O’ Be Joyful, they did enlist (kidnap, they say) the brilliant Amanda Shires on fiddle for “Keeper” and “This Means War,” recording in their van after soundcheck on a final tour stop with Justin Townes Earle in Louisville, Kentucky. New York City-based multi-instrumentalist Nathan Koci appears on the seductive “Tickin’ Bomb” and adds some delicious horn parts on “Hail Hail” that “sounded chaotic and really great all at the same time,” Trent said of his pal’s work. But the fresh, inventive, Joyful noise comes mostly from the creative couple, and they want to keep it that way on tour. Experiments included a live introduction recorded on Trent’s iPhone to “Kemba’s Got the Cabbage Moth Blues” at a show in Beaumont, Texas, where the folksy host asks his customers to keep the conversations down because “We don’t want to know what you cleaned out behind the refrigerator last night”; and a priceless recording that plays during an otherwise somber hymnal called “This Means War,” with a giggle and the voice of a 3 1/2-year-old Cary Ann, who tells her grandfather she wants a poodle she can dress up with ribbons and fingernail polish. “Since it’s such a heavy song, I thought that it might be good to sneak a little rainbow in at the end,” Trent said. On a song in which Trent’s trembling, Dylanesque voice sounds like a tortured soul who decides “I’m on my own,” it’s a touching and surprising end to an album that’ll keep you guessing. The same can be said of Shovels & Rope. Separately, those two words are random objects that might be found in anyone’s garage. But when tied together with an ampersand, they seem made for each other. Just like Michael Trent & Cary Ann Hearst. 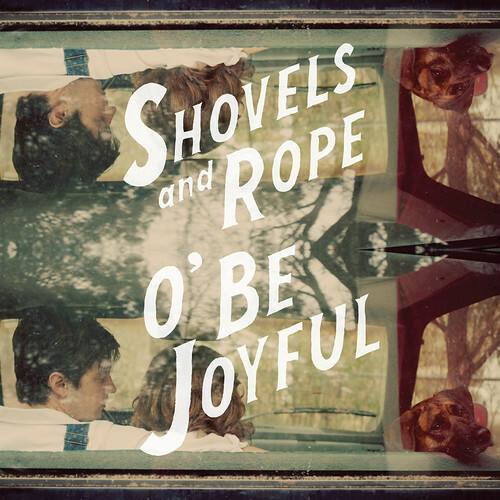 Images courtesy of Shovels & Rope.